Finished block size: 30 x 30 cm plus seam allowances. Sewn by Angela N. Thank you! Here he comes - the gladsome Findus! Findus is a very clever and joyous tomcat who brightens the life of his owner Pettson. The picture books with the stories about this odd couple are very well known and beloved by both children and adults in Europe since decades. If you are not familiar with Findus visit Wikipedia or Hawthorn Press. Additionaly you may search for images of Pettson and Findus by using your search engine. I made up the pattern by courtesy of the creator of the character, Sven Nordqvist from Sweden. The first quilter who solved the riddle was Tina Sch. from Switzerland. I am still waiting for a winner from overseas! If you send a photo of your assembled block to me I will reward you with the full original Findus pattern without distracting misrepresentations of the elements. 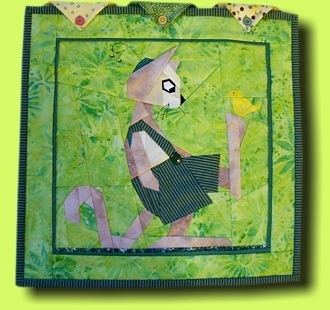 Later on I am looking forward to fill the guest gallery with pretty mini quilts and pillows featuring Findus. Fabric requirements are described in part one. You will need some scraps and at most a fat quarter or 20 cm (8") background fabric. I know quilters love to collect. But this time collecting is not enough! Send me a picture or a scanned image of your already sewn parts (right side up) and I will send the needed pattern pieces in return! As always: Check out my tips for paper piecing.